Porcelain Veneers in Yonge and Eglinton, Toronto - Affordable Cost! That perfect Hollywood smile is not as distant a dream as it seems! Our Dentist can help you dazzle with the perfect smile! Porcelain veneers are fittings for teeth that can help a patient correct misshapen teeth or even cover breaks and chips. They are slowly becoming a popular choice for smile makeovers. Veneers are shaped and formed to enhance the way your smile looks. 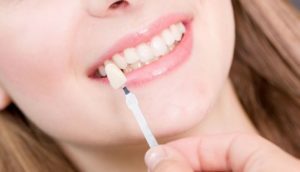 Why should you choose porcelain veneers? These benefits of porcelain veneers, combined with the obvious result of getting the best smile, make them a great choice for anyone looking to enhance their appearance. The fact that they blend in so seamlessly with natural teeth makes us confident in their application! Get your perfect smile molded today with Porcelain Veneers! The first thing a dentist will do is to check whether your teeth is ready for the porcelain veneer process. After you have been approved, the procedure for the mold of the porcelain veneers is done. The veneers are easy to apply, and the entire process can last two to three weeks. Once the veneers are applied, general follow ups are done to ensure they are perfect. The cost of porcelain veneers varies from case to case. Dr. Eleanor Kong and her clinic accommodate every kind of payment method. Your check-up and other preparations will also factor in to the total cost. Find out the cost of getting porcelain veneers easily! Contact us now!